Food Fur Life provides what you need to feed your pets right. Based on the prey model, EZComplete premixes contain liver and pancreas as the nutrient and enzyme-packed organs. EZComplete Fur Dogs combines freeze dried bone (calcium hydroxyapatite) and eggshell as sources of calcium. Dogs thrive with a higher bone content in the diet than do cats, and have higher requirement for many minerals. By using both freeze-dried bone and eggshell calcium, EZComplete Fur Dogs meets the needs of puppies, pregnant dogs, and nursing moms, while keeping a lower overall phosphorus content for senior dogs. Egg yolk, a true nutritional powerhouse, is rich in choline and vitamin E, and also brings almost every nutrient your pet needs. New Zealand green-lipped mussels provide a unique combination of anti-oxidants, anti-inflammatory omega 3s, and are rich in glucosamine and chondroitin, important in joint health. Digestive enzymes bring many benefits, reducing organ stress, improving digestion, and increasing nutrient utilization. Digestive enzymes are an important inclusion especially for those that opt to cook the meat, as cooking eliminates the naturally occurring enzymes in the meat. Tragically, one out of every two dogs will be diagnosed with cancer sometime in their life. Thus we view the addition of kale, brussels sprouts, carrots and blueberries an invaluable inclusion to the diet, helping reduce their cancer risk. Finally, while the bulk of the nutrients are provided by the food ingredients, a few vitamins and minerals are included to account for what is missing by not feeding whole prey. Above all, you supply the fresh, truly human grade meat. You control the primary ingredient in your pet’s natural diet – and Food Fur Life provides the EZComplete premix that makes it balanced and complete in just one easy step. Dried chicken liver, dried egg yolk, calcium hydroxyapatite, eggshell, pork pancreas glandular, NZ green-lipped mussel powder, dried blueberries, dried kale, dried brussels sprouts, dried carrot root, digestive enzymes (bromelain, lipase, amylase, cellulase), sodium chloride, taurine, vitamin E, chelated iron, vitamin B complex, zinc, chelated manganese, chelated copper, vitamin D3, potassium iodide (iodine). An abundant source of amino acids, particularly tryptophan and leucine. Eggs are a nearly perfect food, and the yolk contains the bulk of that nutrition, with almost every essential vitamin and mineral our cats’ bodies need. Egg yolks contain an impressive combination of nutrients, including omega 3s, antioxidant minerals, high biological value protein, amino acids, vitamin D (important for bone building and as an antioxidant hormone), and is one of the foods highest in choline. Yolk is an essential component of the prey model raw diet due to its high choline and vitamin D content. Vitamins. Fat soluble vitamins A, D, E and K. Egg yolks are one of the few natural sources of vitamin D (notably, in the form of cholecalciferol, the more easily accessible form of vitamin D for our cats), and the richest animal source of vitamin E (with 2.5mg per 100g). Minerals. Calcium, iron, phosphorus, zinc, manganese, molybdenum, selenium and iodine. Choline & the B-complex vitamins. All of the B vitamins: thiamin (B1), riboflavin (B2), niacin (B3), pantothenic acid (B5), B6 (pyridoxine), folate (B9), B12 (cobalamin), biotin, and, importantly, is an essential source of choline in the prey model raw diet. Choline is a nutrient vital to the production of phosphatidylcholine, one of the most important structural building blocks of a living cell. Choline is also the backbone of the neurotransmitter, acetylcholine. The importance of acetylcholine cannot be overstated. The part of the nervous system that runs the heart and keeps the intestines moving runs largely on acetylcholine. In fact, any muscle you move requires a signal of acetylcholine to tell it to contract. For cats, ensuring they have a diet rich in choline helps maintain healthy motility of the GI tract, which is especially important for hairball prevention. In humans, choline has been shown to play an important role in preserving memory, other cognitive functions and low acetylcholine levels are associated with the development of Alzheimer’s. A diet rich in choline may help prevent the onset of dementia in your pet. Essential Amino Acids. An impressive mixture of amino acids, at least 10, if not all 11 of the essential amino acids for cats. Most sites indicate the yolk does not contain taurine, and the data is mixed. But the work of A.R. Spitze et al. of UC Davis (Department of Molecular Biosciences, School of Veterinary Medicine), Taurine concentrations in animal feed ingredients; cooking influences taurine content indicates dried yolk contains quite a bit of taurine. Yolks also contain the branched chain amino acids (leucine, isoleucine, valine), sulfur-containing amino acids (methionine, cysteine); lysine, tryptophan, and all other essential amino acids – which is why egg protein is referred to as a complete protein. Essential Fatty Acids. An important source of the omega 6 essential fatty acids, including LA (linoleic acid), and one of the best sources of AA (arachidonic acid). Omega 3 Fatty Acids. A wonderful source of omega 3 fatty acids, notably the preformed (the only way the cat can actually access omega 3s) docosahexaenoic acid (DHA). Sulfur. Egg yolks are high in sulfur, an essential nutrient that helps with everything from vitamin B absorption to liver function; it is also essential for the production of collagen and keratin, which help create and maintain silky soft fur. A source of omega 3 fatty acids can be important in the prey model raw diet, as most of us cannot afford the pastured meats, organically fed that produce meats with healthy omega 6 : omega 3 ratios. The fatty acid profiles of chicken, turkey, beef, lamb, etc. typically contain lower amounts of the anti-inflammatory omega 3s, especially if not pastured while being raised. But the powdered New Zealand green-lipped mussels (GLM) bring a lot more than just a sustainability harvested, high quality omega 3 to EZComplete. Green lipped mussels (Perna canaliculus) are native to coastal New Zealand and one of the only truly environmentally friendly, ecologically sustainable high quality sources of omega 3. New Zealand is renowned worldwide for its unspoiled environment, and green-lipped mussels grow only in its pristine, protected waters, some of the cleanest and most closely monitored waters in the world. Unlike many countries that produce shellfish, New Zealand has very little heavy industry and few sources of pollution. Its growing waters are monitored by independent authorities, and strict rules apply to harvesting the mussels – which require no feed, deriving all they need from filtering the water that passes into their shells and absorbing the phytoplankton. They’re cultured on suspended long lines, not dredged from the ocean floor, and the farms are sited where the mussels naturally occur. Apart from their environmental sustainability and minimal ecological footprint, New Zealand Green-lipped mussels have a long list (and growing) of health benefits. Anti-inflammatory. Green-lipped mussels are naturally rich in omega-3 fatty acids, with over 40 percent of their total fat content coming from omega-3s. There are now over 20,000 published studies on the benefits of omega 3 fatty acids: they have proven anti-inflammatory properties important in the management of asthma, arthritis, eczema, psoriasis, lupus and diabetes (improving insulin sensitivity); they reduce total body inflammatory status (as measured by elevated cytokines and other markers of inflammation such as C-reactive protein); they’ve been shown to reduce brain shrinkage, protecting memory and endothelial function; they contribute to cardiovascular health; finally, omega 3s also increase the activity of antioxidant enzymes. A highly bioavailable form of omega 3. Uptake of omega 3s differ depending on the form; when fatty acids are bound to phospholipids, as in green-lipped mussels and krill, it is more easily absorbed into circulating blood plasma. A very unique combination of omega 3 fatty acids. Green lipped mussels have a unique combination of fatty acids not found in any other marine or plant life, and include a rare omega 3 called Eicosatetraenoic acid (ETA) in addition to DHA and EPA. Additional joint healing / anti-inflammatory benefits. Green-lipped mussel powder from whole green-lipped mussels has synergistic anti-inflammatory benefits to the omega 3s, as they are also an excellent source of glucosamine and chondroitin, important in joint health. A source of antioxidants. The whole mussel powder is a rich, natural source of antioxidants (including vitamin E) and antioxidant co-factor minerals (zinc, copper, and manganese) that help them work: the antioxidants come from the phytoplankton on which the mussels feed. Gastroprotective benefits. 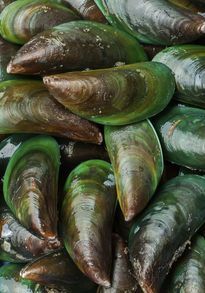 Freeze-dried powdered preparations of whole green-lipped mussel “strikingly reduced the gastric ulcerogenicity” of gastric lining irritants, demonstrated in the study Gastroprotective and anti-inflammatory properties of green lipped mussel (Perna canaliculus) preparation, and GLM is also shown to remedy the side effects of chemotherapy and radiation due to mucositis, and inflammation and ulceration of the lining of the mouth, throat and/or GI tract that is experienced by 40% - 60% of cancer patients. An excellent source of nutrition! In addition to all of the above, shellfish are an excellent source of protein, trace minerals, and importantly for our kitties – taurine. Green lipped mussel powder is also rich in vitamin E, with 1.5g per 100g. As you can see, the powdered NZ green-lipped mussels bring a host of nutrients and health benefits to EZComplete premixes, in addition to their unique omega 3 fatty acid profile. As a whole food ingredient, they provide synergistic benefits to the alternative of providing just the oil. Eggshell is used in the EZComplete premixes as a fresh bone alternative and the primary source of calcium in the premix for cats. (Eggshell is used in combination with freeze dried bone - calcium hydroxyapatite - in the premix for dogs). The eggshell used in our supplement includes the membrane, which contributes to joint health as the connective tissue and cartilage in bone would. Bone provides an essential source of calcium and some trace minerals in a whole prey or prey model raw diet. It is also the body's largest repository of phosphorus, and provides a significant amount to a raw diet made with bone. This is important for growing puppies and kittens, who have a much higher phosphorus requirement than adults; but the level of phosphorus in a raw diet with bone may not be appropriate for older cats and dogs, and is inappropriate for cats and dogs with kidney disease. Fortunately, meat and organs also contain phosphorus with only trace amounts of calcium. Calcium and phosphorus work in tandem (along with magnesium and vitamin D. Each have important roles in the proper use of calcium by the body) and must be provided in the proper ratio. This is easy to do with powdered eggshell. With adjustments to the ratios of meat and organ, a food made with eggshell instead of bone can be designed to meet the needs of kittens and puppies (and pregnant or lactating females) AND our senior cats, even those with early stages of kidney disease. In the prey model, the amount of bone in the diet is determined using a percentage of weight, namely, the average percent of bone that occurs in the prey of cats (usually targeted at 7% - 8%) and dogs (usually targeted at 10%). It is an imprecise method of management, especially as cats and dogs with impaired GI systems may not properly metabolize whole bone. Powdered eggshells (and the powdered freeze dried bone in the dog formula) are an excellent whole bone substitute, the minerals easily accessible even by dogs and cats with impaired GI health. It should come as no surprise that chicken eggshell is composed of similar minerals as chicken bone, only with significantly less phosphorus and sodium. This makes eggshell the perfect bone substitute for cats (and dogs, though kidney disease is not as common in dogs as cats) requiring a low phosphorus diet. Analysis of eggshells from varying breeds of chicken, duck and quail from around the world find underlying similarities. The primary mineral in eggshell is calcium carbonate, accounting for 96% - 97% of the chicken egg. The 3% - 4% of other minerals in the egg are primarily magnesium, with trace amounts of sodium, potassium, zinc, manganese, iron, copper, boron, chromium, selenium, and vanadium. Obviously the diet of the chickens will influence the trace mineral composition of the eggshell. 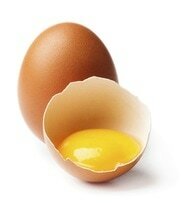 Notably, eggshell membrane has been shown to be an excellent supplement for joint health. Eggshell membrane delivers all the primary nutrients joints need to stay healthy, including collagen, chondroitin, glucosamine, and hyaluronic acid. The eggshell powder used in EZComplete contains the eggshell membrane. Through the process of ingestion and metabolism, the glucosinolates are turned into biologically active compounds – indoles, thiocyanates and isothiocyanates – that prevent cancer cell growth. These compounds have a number of functions, one of the most notable being (in “plain English,”) the stimulation of the liver to produce detoxifying enzymes that block cancer-causing free-radicals. Finally, blueberries have the highest antioxidant capacity (at the cellular level) of all commonly consumed fruits. One of the most notable antioxidants in the blueberry is also an antifungal and antiviral: gallic acid. This is an extremely well-researched phenolic acid with over 6,500 peer-reviewed scientific articles referencing it. Perhaps most notably, clinical studies have found that (unlike in radiation and with chemotherapy), gallic acid-rich foods have the ability to kill cancer cells without harming healthy cells. Gallic acid is also neuro-protective, and the anthocyanins in blueberries are not only powerful anti-inflammatories, they’ve been shown to increase insulin sensitivity and glucose metabolism. The best diet in the world won’t contribute to health if the food is not being digested properly. When there are insufficient enzymes present, we do not get all of the nutrition we could from the food we eat. One of the primary purposes of the gastrointestinal tract is to extract nutrients from foods, digest those nutrients into units small enough to be absorbed, and eliminate the waste products. Food that is not completely digested in the small intestine continues to the colon where it is broken down by intestinal microbes. This can result in cramping, constipation or diarrhea. Digestive enzymes help ensure food is properly prepared for metabolism in the intestines. Many of our pets (including our own, before we knew better) were eating diets that were less than optimal for their long term health and proper GI function. As a result, many have suffered lasting damage in the form of impaired gastrointestinal motility, allergies and sensitivities, inflammatory bowel disease, diabetes, or pancreatitis - even exocrine pancreatic insufficiency (EPI) is on the rise in cats, and, sadly, is a common problem in dogs. It would seem this process is happening to our cats and dogs. In a 2008 review article on pancreatitis by researchers at Texas A&M, it was noted that necropsy examination of the pancreas of 115 cats (both sick and healthy) discovered findings consistent with pancreatitis in 67% of cases (including 45% of “apparently healthy cats”). Let that sink in a moment. Two-thirds of cats had an enlarged pancreas consistent with chronic pancreatitis. And in our dogs, a 2007 study found that "The prevalence of chronic pancreatitis was 34 per cent... Chronic pancreatitis is a common, under-estimated disease in the first-opinion dog population." We do not know that lack of enzymes in the diet is a cause of or even contributor to pancreatitis. But as the incidence of pancreatitis causing illness in our cats and dogs is rising to alarming rates, we should be mindful of their need for additional enzymes if eating cooked foods. You’ll see many articles on digestive enzymes for cats and dogs recommend animal-based enzymes for regular supplementation in enzymes used as a digestive aid. This is one of the very few instances where we at Food Fur Life disagree than an animal-based option is the better choice as a digestive aid (we note that prescription animal-based enzymes must be used under veterinarian guidance for treatment of exocrine pancreatic insufficiency). Yes, we include pancreas as a second secreting organ in the prey model: but this is an organ in its entirety, not a bile or enzyme extract. The extracted pancreatic enzymes used in prescription treatments are strong and acidic, as is ox bile, another animal-based enzyme frequently found in enzymes marketed for digestive health. Anyone that has an animal with EPI can attest: animal-based enzymes burn. They also work in a very narrow pH environment, and their intended use is to apply the enzymes to the food 15 to 20 minutes prior to feeding it, allowing the enzymes to begin the process of digestion before being fed – and most cats and some dogs won’t eat the food prepared this way, due to the strong flavor and potential burning sensation of those enzymes. (Those with pets with EPI sometimes resort to syringing these enzymes). Plant-based enzymes, on the other hand, are mild, virtually tasteless, and survive in a much wider pH environment. When used for digestive health and not intended to treat a condition of insufficiency, plant-based enzymes are effective and well-tolerated. Taurine is an amino acid; amino acids are the building blocks of all proteins. Most mammals produce taurine from other sulfur-containing amino acids (methionine and cysteine), but cats do not synthesize an adequate amount to meet their needs. Cats must obtain taurine from their food, making it an essential amino acid for the cat, though it provides benefits to our dogs, too. include all water used in cooking or all juice run-off with other cooking methods. dilated cardiomyopathy, which leads to heart failure and death. EZComplete premixes contains taurine in sufficient quantity so you do not need to worry about providing taurine-rich meats. But if you can source hearts, most kitties love them! Vitamin E is highly concentrated in egg yolk, fat, and is also found in the liver. Interestingly, in a prey model raw diet, if being measured against the AAFCO measuring stick for minimum nutrient requirements, vitamin E is often found to be lacking – however, what the “static” values in the minimum daily requirements do not indicate is that the need for vitamin E in the diet is related to the selenium content. The more selenium, the less need for vitamin E. Notably, the prey model raw diet tends to be high in selenium, and the AAFCO provides no “moving scale” for the need for vitamin E, other than to note an increased need for it depending on the amount of omega 3s added to the diet. In that study, however, the authors note the need for E is variable dependent on both the quality of the omega 3 and amount of selenium in the diet. Interestingly, despite being a fat soluble vitamin, there is no known toxic dose of vitamin E for cats or dogs: fed even at huge levels for extended periods of time, no interruption of bodily functions has been recorded – but deficiencies are well documented in both cats and dogs. The primary cause of deficiency is a diet high in fish, and it results in a painful condition called steatitis, inflammation of the fatty tissues also known as Yellow Fat Disease. In many pet foods, homemade pet food recipes, and supplements, vitamin E also acts as a preservative, protecting the fats and fat soluble vitamins from oxidation during storage. When we think of vitamin D, we think of sunshine. This is how humans derive most of their needed vitamin D. Not so our pets! Dogs and cats must have preformed vitamin D from eating animal tissue. Vitamin D plays a major role in regulating calcium and phosphorus levels in the bloodstream. Vitamin D stimulates the kidney conservation of calcium so it can be deployed in bone formation, and nerve and muscle control. But vitamin D, it turns out, is important for far more than just proper bone formation and muscle contraction. Low Vitamin D levels are indicated as a causative factor that contributes to the development of heart disease and cardiovascular disorders. Notably, a 2014 study conducted at Cornell found that low concentrations of vitamin D may be a risk factor for congestive heart failure in dogs. Vitamin D is associated with development of numerous infectious, inflammatory, and neoplastic disorders in humans, and vitamin D deficiency has been found to be predictive of mortality rates for many disorders. Cats with IBD and Intestinal Small Cell Lymphoma have low vitamin D levels. Also alarming is a study published a year earlier that indicates cats with inflammatory bowel disease and intestinal small cell lymphoma also have low serum concentrations of 25(OH)D.
While we do not want to minimize the importance of the added B-complex and chelated minerals (iron, zinc, manganese and copper), these are there for protection more than "need:"
the B-complex is added to ensure that no matter which meats you choose to feed your pet (each protein and each cut of protein has a different nutrient profile), and whether ground or cooked, and no matter how long prepared food is stored in the freezer (though please do follow safe storage and use guidelines as per the FDA), the diet will provide healthy, appropriate quantities of each nutrient. in the prey model, the rotation of different meats (both differing protein sources and cuts of meats) and organs (again, differing animal sources of organs and different organs of those animals) usually provides sufficient minerals. We wanted EZComplete to make ANY meat choices complete and balanced, so we included the minerals that may come up short as per the AAFCO minimum requirement measuring stick without risking the possibility of over-supplementation. This means you can buy any meats you like and not worry about whether or not the diet will provide all the nutrients your pet needs. EZComplete premixes are designed to be worry-free!